The IMSA Archives, housed in the Leto M. Furnas Information Resource Center, serves to collect and preserve materials relating to the history and ethos of the Illinois Mathematics and Science Academy. 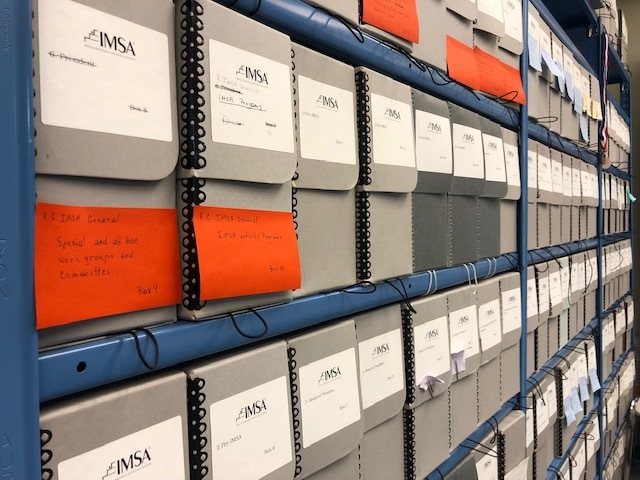 The Archives includes both special and general collections with materials about IMSA's establishment, led by Dr. Leon Lederman and Governor James Thompson. There are materials about the Academy's openings in the fall of 1986 and its development since, as well as about its ideas and programs and how they evolved. We have sample curricula, presidential speeches, samples of student work, as well as material about and from partnership programs for educators and schools. We have both student and institutional publications as well as iconographic material ranging from posters to snapshots. All of the materials illuminate the lives of IMSA's students, alumni/ae, faculty and staff on campus and out in the wide, wide world.